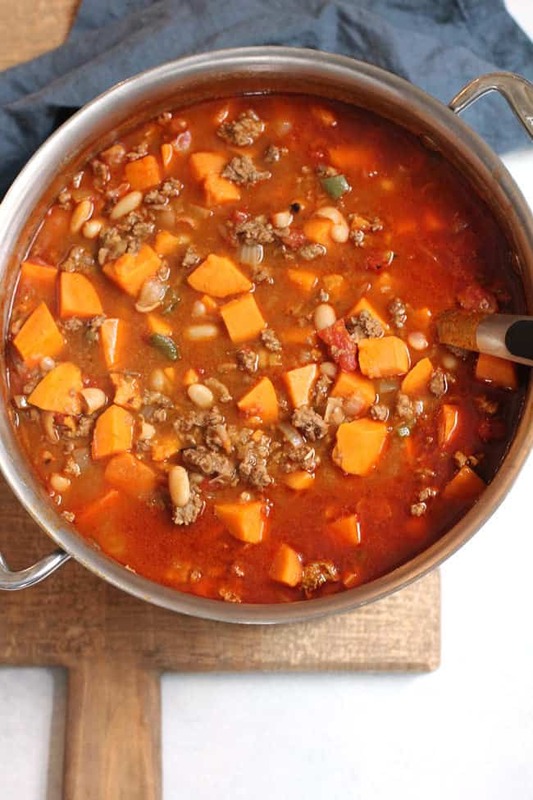 Sweet Potato Turkey Chili is loaded with lean ground turkey, chopped sweet potatoes, tomatoes, beans, and plenty of spices. 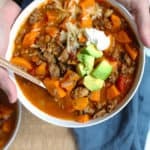 This chili is full of flavor, is both hearty and lean at the same time, and cooks up pretty quickly. Everything you need for a weeknight meal. I love how food takes me back to some memory hidden away in my brain. Like the homemade cookies my mom used to make that lined the back kitchen counter. Warm cookies after school with a big glass of milk to dunk them in. Really, nothing better. Or the nachos my hubby and I used to eat (BEFORE the pizza!) at our favorite pizza joint during our college years. I remember the breakfast burritos I used to cook up for the kids for dinner, after a long evening of running them to sports and activities. And then there is the countless pans of mac and cheese I made during their “picky” years (with perhaps a hidden veggie or two they didn’t know about). Chili is definitely one of these meals. Mom used to make it all winter long, and she filled a big roasting pan for our family of eight. Dad loved beans AND chili powder, so it always had loads of that. To this day, chili really isn’t chili unless it has plenty of beans and chili powder (and for me, jalapeños!). Quick poll. 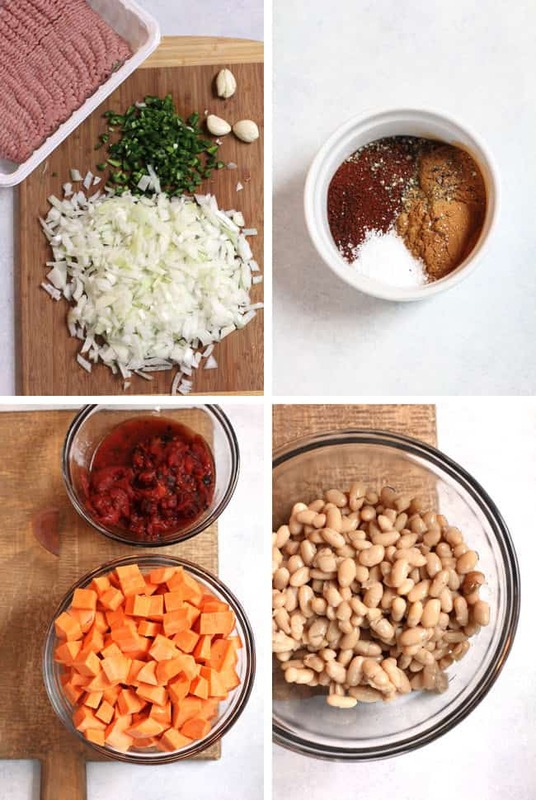 What is your “must-have” ingredients for your chili? Do tell! 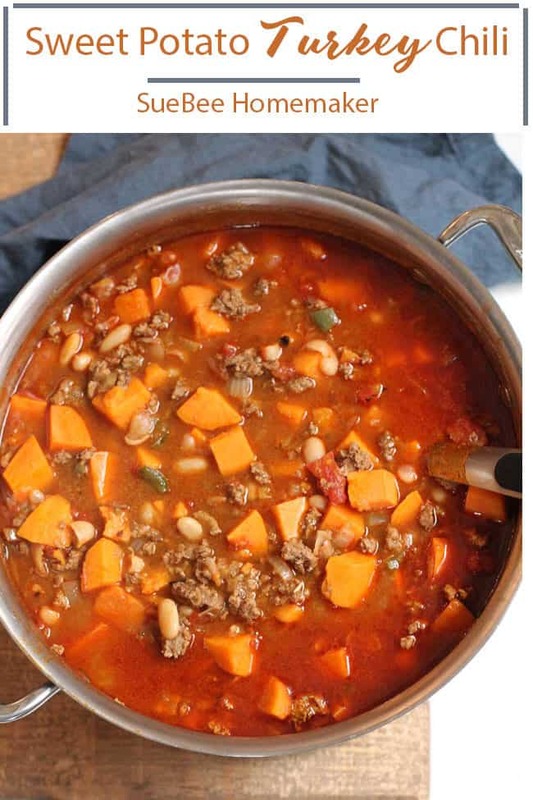 One thing I’d never had, until I concocted this recipe, is sweet potatoes IN my chili. Seems like a weird concept at first, until you try it. But I must admit. The mixture of the sweet from the potatoes is a perfect combo with the spiciness of the chili. SO good, and I think you will soon be a fan! Ground turkey – I use a lean version. The fresh veggies – onion, jalapeño, garlic, and of course, sweet potatoes. Canned goods – fire roasted tomatoes, tomato paste, and beans. 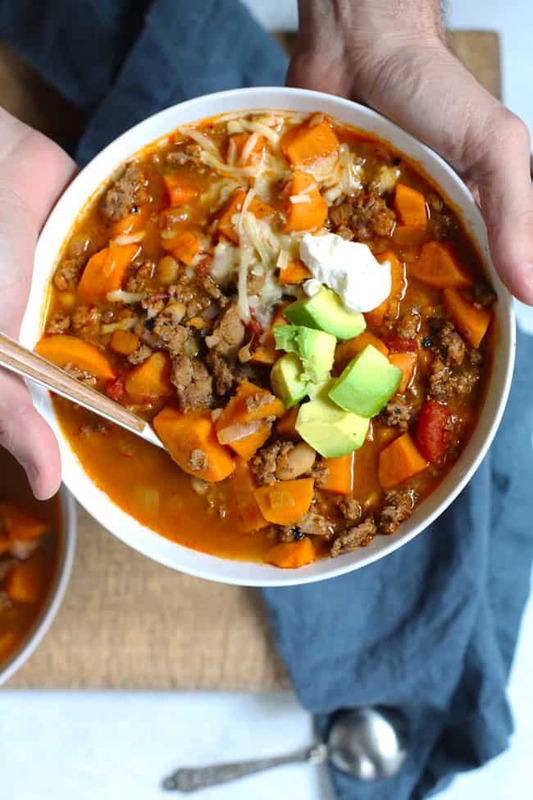 I’m a sucker for a big bowl of soup or chili. Give it to me ANY cool night of the week and I’m a happy girl. There are several ways you can adjust this recipe to your liking. Use ground beef instead of ground turkey. Try another type of bean instead of the cannellini beans. Black beans, chili beans, pinto beans, you name it. Don’t like spicy? Use regular diced tomatoes instead of fire-roasted, go easy on the chili powder and cumin, and skip the jalapeño (or just the seeds). Chili toppings are key, so don’t forget to load it up. Use any variety you like. In large saucepan, heat oil over medium heat. Add ground turkey, onion, garlic, jalapeños, 2 tablespoons of chili powder, 1 tablespoon of cumin, and salt and pepper. Cook until turkey is browned and crumbled, and the onions are soft, stirring often. Remove from pan and set aside. Add the diced sweet potatoes to the same pot along with the remaining chili powder and cumin (and more salt and pepper - to taste). Stir and brown slightly, then add the chicken broth, fire roasted tomatoes and tomato paste. Cook until the sweet potatoes are soft and fully cooked. Add the beans and the ground turkey mixture back to the pan. Stir to combine and cook until the beans are heated through, about 10-15 minutes. Serve chili with shredded cheese, sour cream, and avocado slices. Try another type of bean instead of the cannelloni beans. Black beans, chili beans, pinto beans, you name it. Don't like spicy? Use regular diced tomatoes instead of fire-roasted, go easy on the chili powder and cumin, and skip the jalapeño (or just the seeds). Ok, I was really skeptical about this one! My crew won’t eat sweet potatoes (except Thanksgiving when it is covered in butter, sugar & nuts!) Wish you could have seen the looks on the kids faces when they heard what I was making for dinner! Ha! Ha! But, gotta say this was REALLY good! My hubby thanked me several times for making it! (I took Mike’s advice and bought several avacados!) I did use half turkey & half lean beef. Another awesome recipe Sue! Thanks for sharing! Very easy and fun to make! Best soup I’ve ever had! Your Mom was a very smart lady to make tons of chili! But this one is awesome! My key topping is the avocado slices. Well done! Awesome chili! I used hamburger and a little sugar as I like a little sweetness in my chili. I will try the turkey next time. I did not use jalapenos but it was the right amount of spice for me. And I love the sweet potatoes . A new favorite for me! I made the chili before I read the other comments so I didn’t make any changes. It was excellent and might be a new “go-to” for me. Easy to make with no difficult to find ingredients. It’s excellent. Try it! I made this soup a second time and adjusted it a bit. The first time I made it I had too much fun pureeing the sweet potatoes and didn’t have enough broth to add extra, so it was pretty thick. Since I prefer a brothy soup, I made sure to puree less and add more broth. I adjusted the seasoning just a little as well, because I used a spicy gound turkey and was afraid it would have too much heat. It was perfect for my taste!! This is a worthwhile chili to make – both nutritious and delicious. This is a favorite! I love the hearty flavor, but it doesn’t leave you feeling stuffed. I’m actually having this soup for lunch today. So true. It’s healthy so you can eat more of it! I am a huge fan of “comfort” food so this was right up my ally. I was very easy to make if you buy precut sweet potatoes as I did. Next time I would but them smaller and probably not use the immersion blender. The flavors are fantastic, will make again soon. 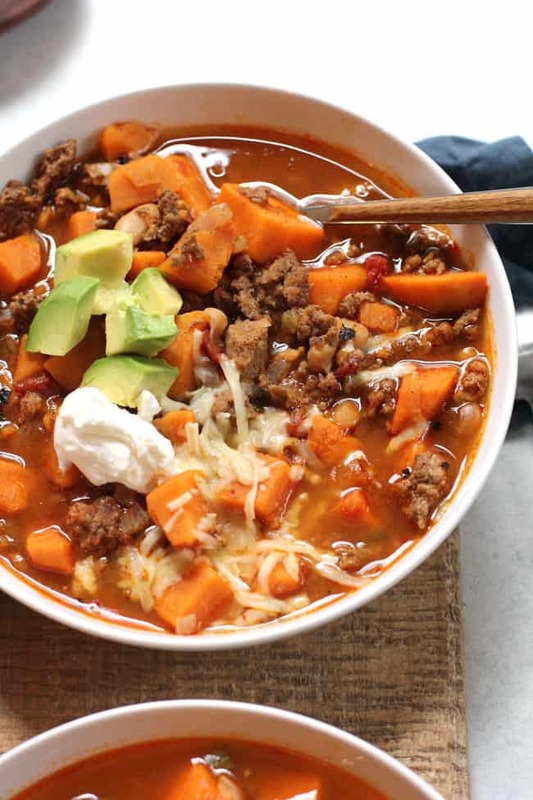 This is a very hearty chili, and definitely serves as a complete meal. I liked that the immersion blender was used for half the potatoes, because it thickened the chili, but you could also eat it without doing that if you prefer. Delicious! !